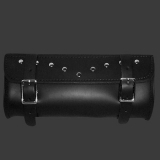 Leather tool pouch with studs and two straps. 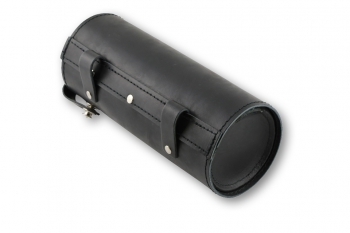 This black 10" x 4" x 3" pouch includes a stud design on the overhead flap and a double buckle closure. 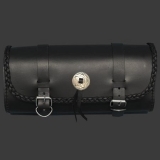 A black, 10" x 4" x 3" leather tool pouch with two straps and buckle closure. 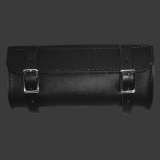 Large, 13" x 6" black leather tool pouch. This leather pouch includes a silver concho, fringe and braid detail along the bottom of the flap, and double buckle closure. Features three strand braid and black chrome Maltese cross. Tool roll ELDORADO from west european production. Genuine leather with leather end caps. Different from all other tool rolls! One touch of a button opens the access to the inside - which is pulled out to the side. Please mention that you need enough clearance to pull out the inside of the roll. You can i.e. mount the roll at the lower front frame, but only with stock controls. Features three strand braid and gold and silver eagle.